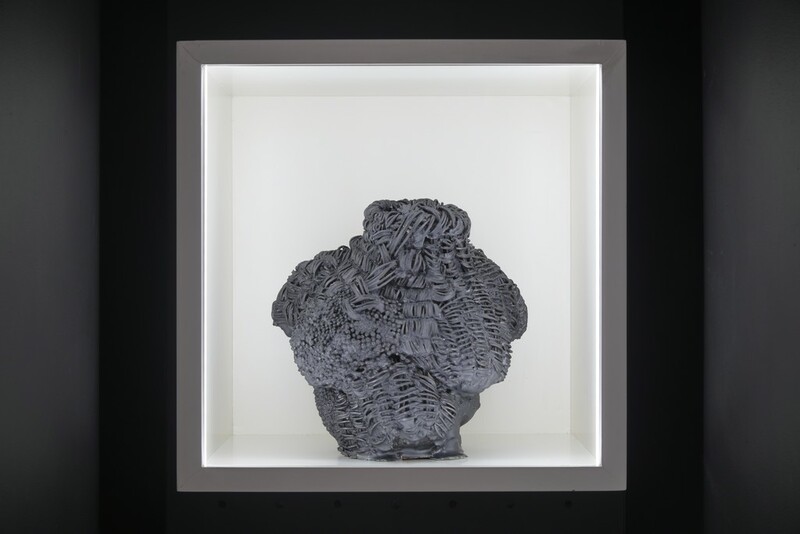 Pippy Houldsworth Gallery is delighted to present a new sculpture by Francesca DiMattio for The Box - a micro project space alongside the main gallery. 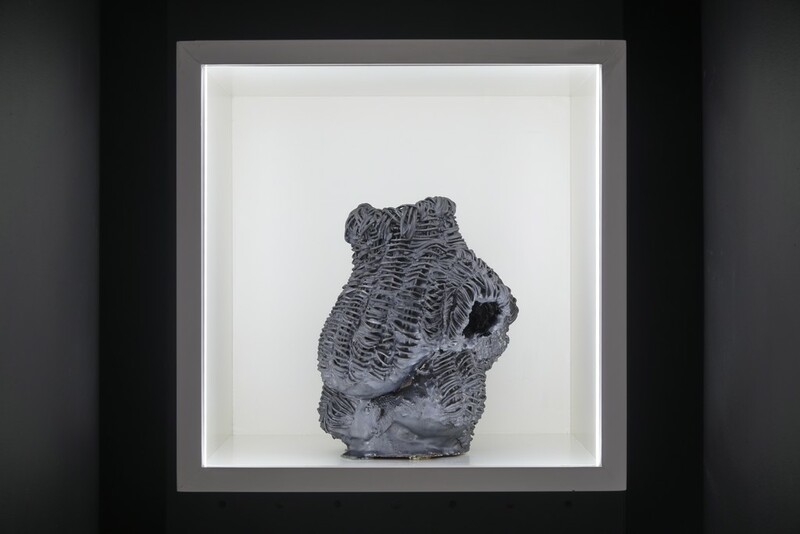 Pippy Houldsworth Gallery is delighted to present a new sculpture by Francesca DiMattio for The Box – a micro project space alongside the main gallery. Unsettling our perceptions of texture, function and form, DiMattio challenges traditional assumptions about the feminine and the domestic. In earlier work the artist has drawn inspiration from brightly-coloured porcelain and Boucherouite rugs, subverting the image of commodities considered decorative. 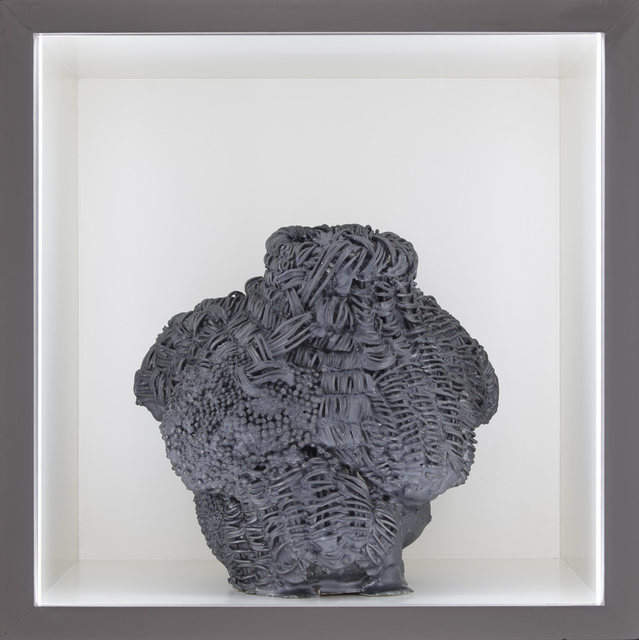 This new ceramic monochrome shifts greater focus towards sculptural form and its history. 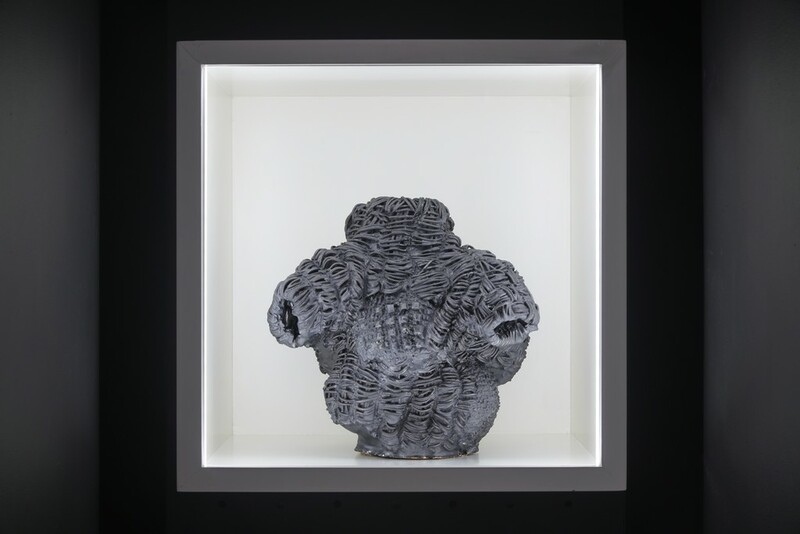 Bust is a headless, legless, armless object – a broken body bound by rope, baskets beading and braiding – animated in its rough evocation of the human body. DiMattio gives unexpected agency to household items defined by their function to contain, proposing a reconsideration of domestic possibilities. The viewer is presented with seeming contradictions. A diminutive fragment is masked with a bronze-like glaze, simultaneously evoking exquisite ornamental objects and monumental sculpture. Textures of domestic craft and feminine adornment envelop the surface. Yet the work is not soft and delicate – it appears assertively hard. Rope and basket appear even to threaten the body, binding and contorting its form. By repurposing these objects, DiMattio highlights the closeness of opposing elements within a whole. This idea is reflected in the title – Bust – alluding to physical breasts and a genre of portraiture. Uniting disparate aspects of the work, the monochrome glaze highlights the relationship between surface and anthropomorphic form. The textures, then, appear as a kind of skin – DiMattio notes that the ‘beading feels more like scarification than decoration’. This implies that adornment does not function only to be pretty, but is a construction of identity and indication toward deeper content beyond the surface. Francesca DiMattio (b. 1981) lives and works in New York. Her practice includes painting and sculpture. Recent solo shows include Salon 94, New York (2018, 2015); Pippy Houldsworth Gallery, London (2015); Blaffer Museum, University of Houston, Texas (2014), Zabludowicz Collection, London (2013) and ICA, Boston (2011). Her work has been shown in group exhibitions at Saatchi Gallery, London; Wellin Museum of Art, New York; White Flag Projects, St Louis; Cluj Museum, Romania; Centre for Contemporary Art, Ujazdowski Castle, Warsaw: Prague Biennial; and New Jersey Museum of Contemporary Art amongst many others. DiMattio’s work is in collections worldwide including Perez Art Museum; Saatchi Gallery, London; Miami; Zabludowicz Collection, London; Jimenez-Colon Collection, Puerto Rico; Frances Young Teaching Museum, Saratoga Springs and Paisley Museum & Art Gallery, Glasgow. A monograph, Francesca DiMattio, was published in 2014 alongside her exhibition at the Blaffer Art Museum, University of Houston, Texas. 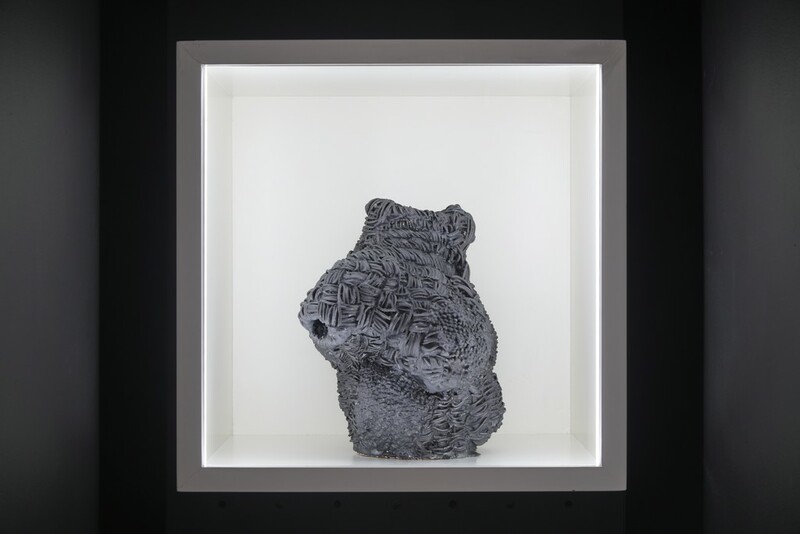 The Box is a hollow white cube (45 x 45 x 45 cm) which hovers at the back of a narrow black passage alongside Pippy Houldsworth Gallery's main gallery. Initiated in 2011, The Box programme to date has included, amongst others, works by David Batchelor, Zarina Bhimji, Nathan Coley, Shezad Dawood, Holly Hendry, Susan Hiller, Jitish Kallat, Dean Levin, Paul McCarthy, Shana Moulton, Martha Rosler, Arlene Shechet, Alina Szapocznikow, Yinka Shonibare MBE, Gavin Turk, Ai Weiwei, Jane and Louise Wilson, and Bill Woodrow.